In case you haven't noticed, there seem to be an awful lot of Hulks running around the Marvel U lately. Between Red versions of the regular Hulk and the She-Hulk, the barbaric son of the Hulk, Skaar, good old regular She-Hulk and The Leader, the local population of rage-induced goliaths seems to be at an all-time high. Of course, the one guy who doesn't turn into a green monstrosity when he's angry, oddly enough, is Bruce Banner. Instead, Banner's been teaching Skaar the nuances of heroism and aligning with the mysterious Red Hulk in his quest to halt the advances of The Leader. Because, really, if there's one thing gamma-infused giants aren't known for, it's their levelheaded rationality. If that quick-glimpse peek at the status quo sounds confusing, you have no idea. Greg Pak's story has about a dozen plates spinning on its fingertips at any given moment, and this month we're compulsively checking in on the status of each one of them from start to finish. Reading this issue is like taking a peek into the imagination of a child with severe ADD. Within the first six pages, my head was spinning. When the constant leaps between locales hadn't let up two-dozen pages later, I think I was just about ready for some tranquilizers. While some of this can be blamed on my jumping in on the midst of a large-scale storyline with the requisite “epic ramifications you will never forget,” a greater part of it can be blamed on bad storytelling. Pak glosses over important details, like how certain characters make their way across the globe in the blink of an eye, and loses himself instead in the hyperbolic diss-off between Banner and Dr. Doom in the middle of a fight scene. It's scatterbrained at best, and not even compellingly so. I had an equally hard time keeping up with Paul Pelletier's neurotically intricate artwork. Pelletier's layouts are strong enough, moving the story efficiently and legibly, but he rarely takes any risks or stretches a situation into something larger than life. Instead, he obsessively decorates almost every square inch of the page with linework, a mindset that's only amplified by Frank D'Armata's intrusive, constantly gleaming colors. If the artwork was too busy to begin with, the colors only serve to magnify that problem. Every little wrinkle or dancing shadow is reinforced to the Nth degree, with even the most innocuous scenery rendered with painstaking precision and depth. I can't fault D'Armata for his skill level – the guy knows his way around the digital spectrum – but his sense of restraint needs a lot of development. Sometimes it's OK for a background character to just be a background character. If everyone's treated with the same amount of heavy depth and detail, the front of the page can get crowded in a hurry, to the detriment of the issue's legibility. Strange as it may sound, returning Incredible Hulk to its original owner may have been the worst thing Marvel could have done. 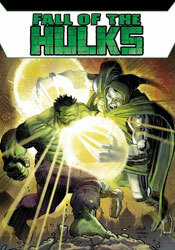 They'd taken an incredible (har har) risk in handing the series over to Hercules following World War Hulk, but Pak and Fred Van Lente have actually pulled an upset and made the replacements more intriguing than the original occupants. Now back in the hands of the green goliath, the series feels dated and unnecessary. It's missing the sharp, self-satirizing edge Hercules still carries in his own ongoing series and has, instead, become precisely the kind of story that Herc's series continues to lampoon. I didn't like this one bit. Skip it.